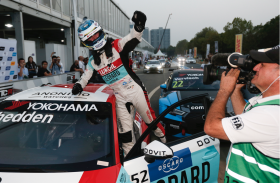 Gordon Shedden produced his best weekend of the 2018 FIA World Touring Car Cup season to-date to take his first podium, pole position and race victory all in the same weekend, amassing the most points of any driver – 52, the same as his race number. The three-time British Touring Car champion worked hard with the Audi Sport Leopard Lukoil Team in the days before the race after a tough meeting last week at the Chinese Ningbo circuit, and things looked much better right from the off at the Wuhan street circuit, with the Audi Sport customer racing RS 3 LMS right at the top of the time sheets throughout Friday practice. Another qualifying session and two races on Sunday and things were about to get much better, as the Scotsman topped the second part of qualifying, earning him the final run on the one-lap shootout, where he secured his first career pole position ahead of three other Audis. The team managed to replace the entire steering rack inbetween races, allowing Shedden to take up pole position for the all-important Race 3. “It’s been an absolutely epic weekend. The car’s just been transformed since last week. There’s a lot of work done by the team behind the scenes, and this is the first weekend where I feel like I’m part of the car, and it makes such a difference.